With the final votes still being counted, Sen. Mark Warner said Thursday he's eager to return to the Senate for a second term and push harder for a centrist agenda. NBC News has called Warner the "apparent' winner of the election. New totals posted by the State Board of Election Thursday afternoon showed Warner with a lead of 16,540 votes over Republican Ed Gillespie. Fairfax County wrapped up its canvass Thursday evening, leaving just 499 provisional ballots to be considered Friday. While errors were discovered that shifted several hundred voters into Warner's column, there were no big changes. On the same day, Warner said he's confident his lead against Gillespie will hold up, even though Gillespie has not conceded defeat. Warner said the message he takes away from the race is the importance of bipartisanship and cooperation. "My first task is to be more of a disruptor to show that we can get the Senate to actually work,'' Warner said. Warner made no apologies for the way he ran his campaign, which appealed more to the political center than the Democratic base. He had been expected to win handily, but holds a lead of less than a percentage point over Gillespie. "I know there have been some who have argued for me to be more of a red-meat issue guy. You know, I'm going to stay focused on the issues I think are terribly important to this country,'' he said, citing the budget deficit as a top priority. Virginia is one of three Senate races that remain uncalled after Tuesday's midterm elections. All three incumbents are Democrats. In addition to Warner, Sen. Mark Begich in Alaska is defending his seat against Republican Dan Sullivan in a state that doesn't begin counting absentee ballots until next week. And in Louisiana, neither Democratic Sen. Mary Landrieu nor Republican Bill Cassidy won a majority in Tuesday's all-parties balloting, forcing the pair into a Dec. 6 runoff. None of the outcomes will change the balance of the Senate. Republicans on Tuesday gained seven seats in the 100-member chamber, more than enough to grab the majority next year. Warner has been a leader in bipartisan efforts to reach budget deals that could be tolerated by Democrats and Republicans. He said he believes his colleagues still have a desire for bipartisanship, and he thinks he has a better feel for turning some of those discussions into tangible gains. 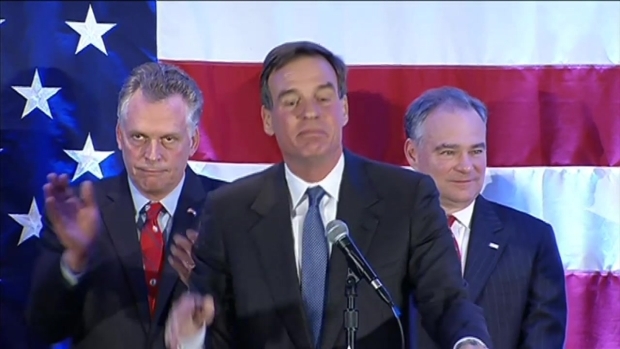 RAW VIDEO: Va. Sen. Mark Warner delivers a hopeful speech in which he declared himself a winner in Tuesday night's contest, despite the race being too close to call. Gillespie has not spoken publicly since Election Night, but his spokesman, Paul Logan, says Gillespie and the rest of the campaign team are waiting for the final tally to be reported. Logan said no decision has been made on whether to seek a recount. "There's not even a decision that can be made at this point'' on a recount, Logan said, noting that the State Board of Elections doesn't even certify an official count until Nov. 24. If the totals don't change significantly, Gillespie would be entitled to demand a recount at that point, but would be required to pay for it. 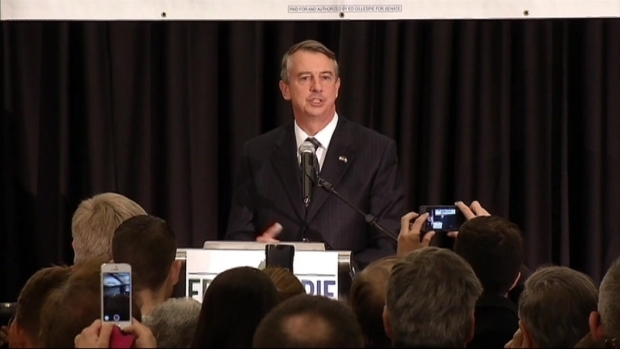 RAW VIDEO: Va. U.S. Senate hopeful Ed Gillespie (R) told his supporters he's going to keep rallying in the coming days -- the Virginia U.S. Senate race between Gillespie and Mark Warner (D) was too close to call Tuesday night. Warner spoke just a few blocks from where elections officials are conducting their vote count in Fairfax County, by far the state's largest jurisdiction with a population of more than 1 million. Fairfax County vote totals represent nearly 15 percent of all ballots cast statewide. Brian Schoeneman, secretary of the county elections board, said he hopes the county to complete its canvass by late Friday, ahead of the state's Tuesday deadline. So far, the canvass has found a few minor computational errors -- one precinct, for instance, accidentally recorded 351 votes for the Libertarian candidate, Robert Sarvis, when it should have been 35. 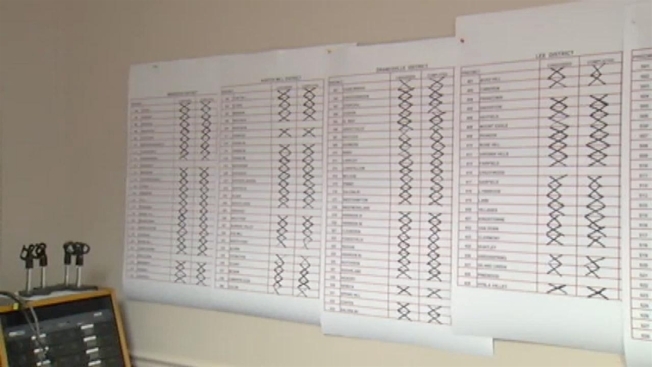 Still ahead, the board must decide whether to count about 500 provisional ballots. Schoeneman said that, based on past experience, more than half of those ballots will be added to the count.